Advanced manufacturing firm, Mallaghan Engineering, is embarking on a multi-million-pound investment and recruiting over 200 additional staff, to secure the future growth of the business. Welcoming the news, Invest Northern Ireland Chief Executive, Alastair Hamilton, said: “Mallaghan Engineering is investing in production capabilities, R&D, skills and jobs in a significant expansion at its Dungannon headquarters. “Commercial air travel is a vast and growing industry. The productivity boosting capital equipment and extensions to Mallaghan’s factory space will help the company satisfy the growing demand for ground support equipment worldwide. Mallaghan Engineering designs, manufactures and supplies ground support equipment for the global aviation industry, primarily to service commercial aircraft. Its principal products are high lift trucks for catering, cabin cleaning and facilitating restricted movement passengers as well as de-icing rigs, water and waste trucks, baggage conveyors and various forms of passenger stairs. 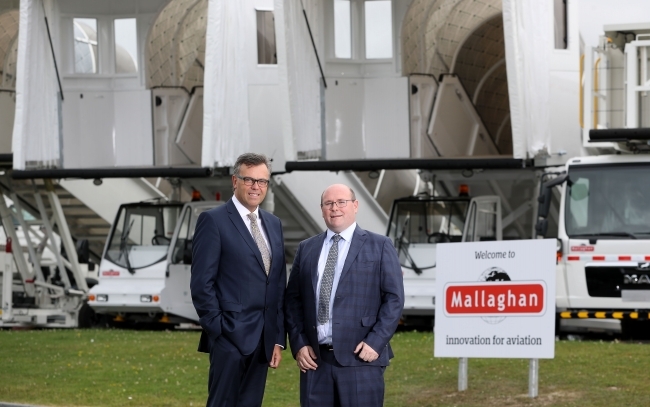 Ronan Mallaghan, CEO of Mallaghan Engineering added: “Mallaghan is one of the fastest-growing Airport Ground Support Equipment manufacturers worldwide and this expansion is designed to help secure the future growth of our business.